Saturday was date night. We went to Cineopolis to see The Secret Life of Walter Mitty. I loved it. It's one of those feel good movies that makes me feel enlightened and enriched in some way just from having watched it. It made me feel all warm and fuzzy inside. I'm surprised I didn't cry. Walter Mitty is your average Joe like anyone else. He's been working in the basement level of Life Magazine for 16 years in the negative assets department and stresses out about keeping the bills paid. Life Magazine is transitioning from the print version of to Life Magazine Online. He is the timid, worker bee who hope that he still has a job when it's all said and done who is belittled by the hot shot jerk of a younger guy in charge of overseeing the transition. Day to day life is pretty mundane except when he goes into one of his trances and thinks of all the things he wishes he had the guts to say or the super human abilities to do. I think we all kind of do that. What if. If only. One day. I wish. Then suddenly he finds himself going to places and doing those things that he only dreamed about before. He goes from underdog to trailblazer and with it comes a confidence that he didn't have before. In the movie the Life Magazine mission statement is: “To see the world, things dangerous to come to, to see behind walls, draw closer, to find each other and to feel. That is the purpose of life.” The words are vague and broad and yet so universally specific at the same time. I think we can all find meaning in it. One of my favorite quotes from the movie is when one of the characters says, "Beautiful things don't ask for attention." This really stood out for me in it's simplicity. In this day and age of me, me, me and the non stop social media attention seeking frenzy it's a really refreshing way to look at things. What makes you beautiful? Your great smile or 100 likes on Instagram? Just be. Do beautiful things and be your beautiful self without regard to who's watching and what everyone thinks about it. That in and of itself is beautiful. The movie definitely raises some questions in terms of how realistic it is. Is there really a Papa John's in Greenland? Is it really possible to get cell phone reception in Iceland? Is e Harmony really $500 per year? But it's a movie. I loved the storyline so much that I really didn't care about the actual reality of such things. The acting was great, the characters were touching and I loved the story and there was even a little bit of romance. I give it a thumbs up. After the movie MJ was in the mood for chocolate so we went over to this really cute restaurant called D Bar. We sat at the dessert bar so we got to see the chef's putting together all of these tasty looking desserts. 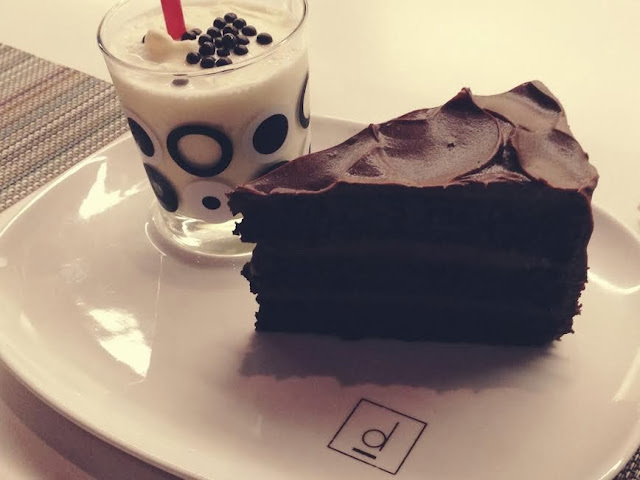 This three layer chocolate cake was really good and it came with a vanilla shake. How adorable is this presentation? They really pay attention to detail there. The couple next to us had Bacon Macaroni and Cheese that looked really good so we will be going back and that's definitely what I'll be getting. I really want to see that movie! So glad that you gave it such a great review. And your dessert looks amazing! That cake looks divine! Sounds like a great movie! I thought the movie was so good, and inspirational. No matter what it is time to go out and live out adventure! Go out and explore the world to either find a negative, or true meaning. It is so important. Also, that quote stood out to me so much also. Thinking in those terms really does change how you look at the world. Dying to see that movie! Not to mention this cake looks amazing. Sounds like the perfect date. The chocolate cake looks great but now you have me craving bacon mac and cheese. I like that quote - beautiful things don't ask for attention. I'm sitting in a restaurant right now working but this couple close by is having a heated discussion; this was a welcome distraction. I am hosting a giveaway on my blog that ends next week! And now I need dessert. That dessert. Immediately. I've heard such good things about this movie! Can't wait to see it. The movie looks good and your review confirms it. Cake looks crazy good! I have nominated you for the Superstar Blogger Award. I didn't know much about this movie but you make it sound awesome! I will add it to my list. and that milkshake looks soooo good! you seriously lost me at that chocolate cake....it looks soooo good! but i did hear good reviews on this movie and that Ben S was awesome in it too...there are so many movies i still have to watch! I'm so glad you liked that movie, because I want to see it!! That D Bar looks AMAZING!! Now I really wanna see that movie!! Your thoughts are really deep and totally persuasive :). And that cake has me drooling...def go back and get the Mac n cheese! Mmmm that cake looks absolutely divine! I would love to see this movie...or any movie. It's be years. No joke. A movie and dessert? Beyond my wildest dreams! Glad you had a good date night. Ohhhh that cake! Mouth is now watering. Walter Mitty looks cute but I haven't sen it. It looks like one of those mindless, feel good movies and I tend to love those!